Just layer your own 3D terrain and figures over this mat and you are ready to game! 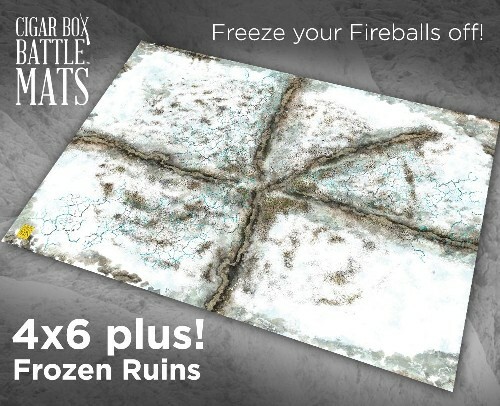 This mat is ideal for games set in a ruined, frozen and magical environment. Perfect for your games of Frostgrave, Mordheim, Dungeons and Dragons, GASLIGHT, etc. Let your imagination run wild! This mat is will fold up into a backback and is easily transportable to your local club or hobby shop! Just put out on the table, smooth out by hand, and add your troops and additional terrain! This mat will provide you and your friends hours of gaming excitement.